Ever since I abandoned face wipes and turned to micellar waters I realised removing my eye makeup was a toughie. My Garnier Micellar Cleansing Water is fab, however when I’m wearing stubbon eyeliner or waterproof mascara I’m in need of something that’s got the power to shift it. I’ve been testing out two of Garnier’s eye makeup removers for a few months now; Garnier Skin Naturals Fresh & Garnier Skin Naturals Express 2 in 1. Read below to find out which one got the thumbs up & the thumbs down from me. I bought this as I loved the look of the 2 phased bottle, which I’d only seen before with the Clarins Instant Eye Makeup Remover; a not-so-cheap £16.50. Garnier’s version was just £3.49 (currently on offer for £2.33 at Boots! ), so this budget buy was a quick addition to my nightly skincare regime. Whether it compares to Clarins’, I don’t know. I do know, however, that it’s soothing and gentle on my eyes. It claims to remove your eye makeup in one swipe, which is a very ambitious claim. It gets mine off with a couple of gentle rubs, which is fine for me. The other downside is the slightly greasy feeling it leaves on my eyes; however this isn’t a huge issue as I always use a cleanser immediately afterwards. Other pluses: there’s no unpleasant smell, and a few drops on a cotton pad is enough to do the job, so one bottle will last ages. I picked this one up in the hopes that it would live up to, if not be better than the Express 2 in 1. I had seen lots of favourable reviews, so I was surprised to end up hating this product. Hate’s a strong word, but I was truly disappointed with this one. On my first try, I applied the makeup remover as normal, to find it was stinging my eyes so badly I had to wash it out. They became really puffy and extremely sore, which stayed with me throughout the next day. It didn’t stop me using it though as I have the awful ‘waste-not want-not’ attitude, so I continued to use it in a very small dose. It didn’t sting but still left my eyes slightly red. A couple of weeks later, I gave up. Although I really liked the apple scent and the non-greasy feeling, it just didn’t work for me. It wasn’t gentle enough, even though it claims to ‘respect the delicate skin around the eye’. Therefore I returned to the Express 2 in 1. I am still on the hunt for a better one, and am yet to try out L’Oreal’s eye makeup removers. If you’ve tried them, please let me know! 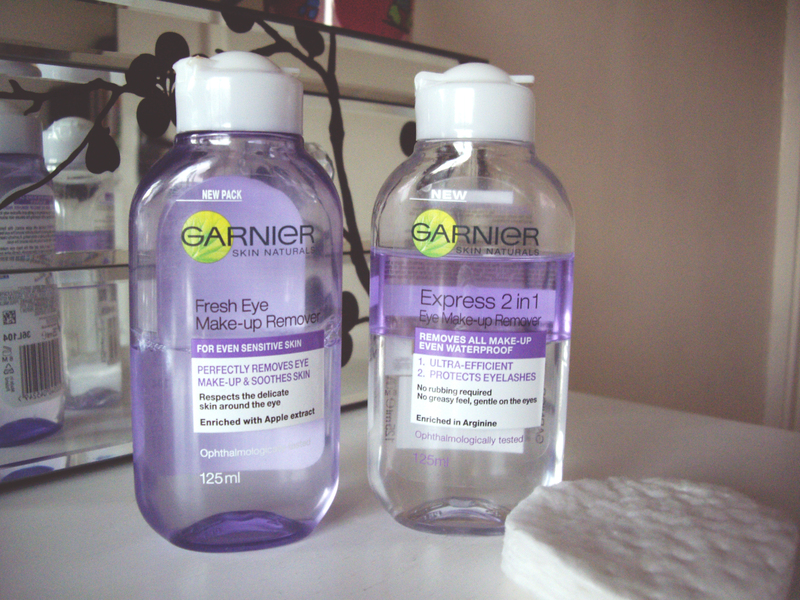 What do you think of Garnier’s Eye Makeup Removers?